2003 : General Manager, Fairmont Olympic Hotel. FRHI operates as a global hotel management company with over 105 hotels in 33 countries. 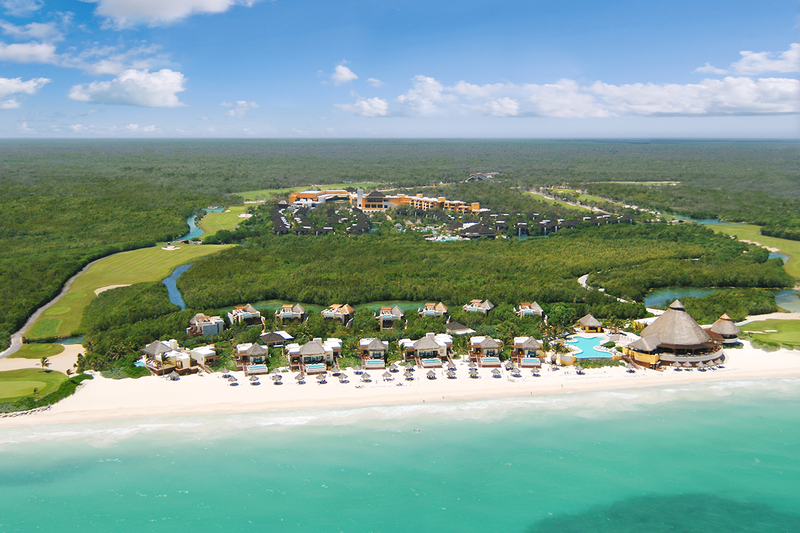 Known as the “Venice of the Caribbean”, Fairmont Mayakoba was built on 240 acres of tropical forest intersected by crystal clear natural waterways on the Caribbean Sea. Designed around preserving and protecting the natural mangrove jungles, flora and fauna, an ancient Mayan technique called “socoleo” was implimented to protect more than 1,500 trees and 40 species, including exotic birds and iguanas. In partnership with world-renown chef and restaurateur, Richard Sandoval, all restaurants and bars were redesigned to feature new decor, concepts and menus. • New lounge chairs and floor re-finish in main areas & pool decks (2016). 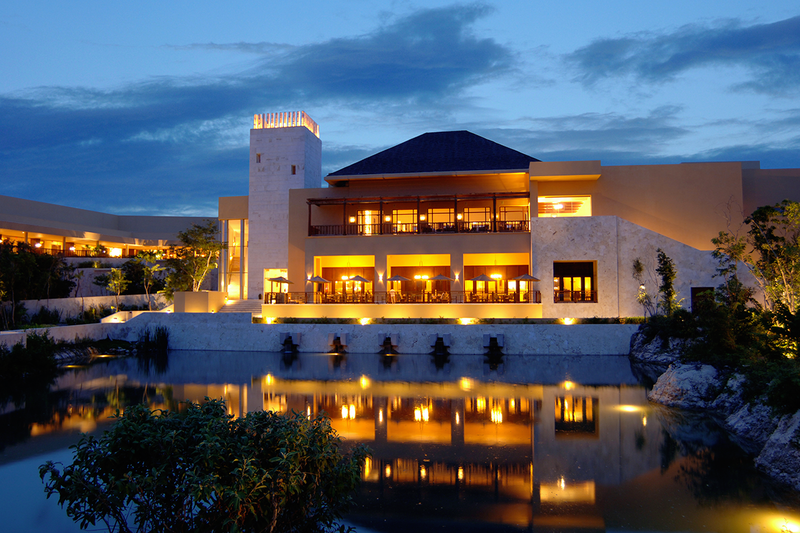 Fairmont Mayakoba offers a unique and personalized luxury guest experience in all aspects of the stay. 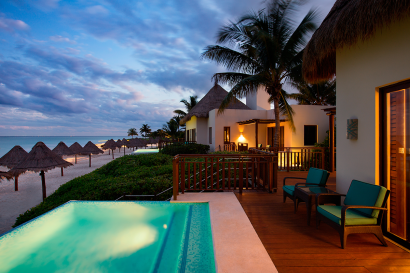 The Resort has a combined total of 13 Ocean Front and Beach Area Suites featuring private plunge pools, and 19 Beach Area and Ocean Front Casita Guest Rooms. Personal butler service in this most desirable area of the resort affords guests the ultimate pampered guest experience. The Resort offers both European and All Inclusive Rate Plans, allowing the guest to customize their stay and inclusions. 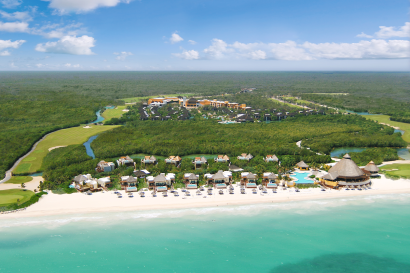 The Resort is located in the Mayakoba luxury resort community, approximately 42 miles or 68 km south of Cancun in Riviera Maya. 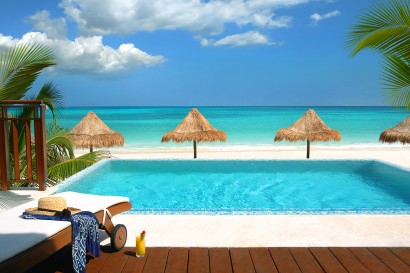 Riviera Maya is located in the State of Quintana Roo, Mexico on the Yucatan Peninsula alongside the Caribbean Sea. Stunning white sand beach and five swimming located pools throughout the resort including a children’s waterslide and an adults-only infinity edge pool overlooking the lagoon. Nature trails to be explored by foot or bikes, scenic boat tours on crystal clear canals and non-motorized water-sports. Playa del Carmen is a 15 minute drive from the resort. 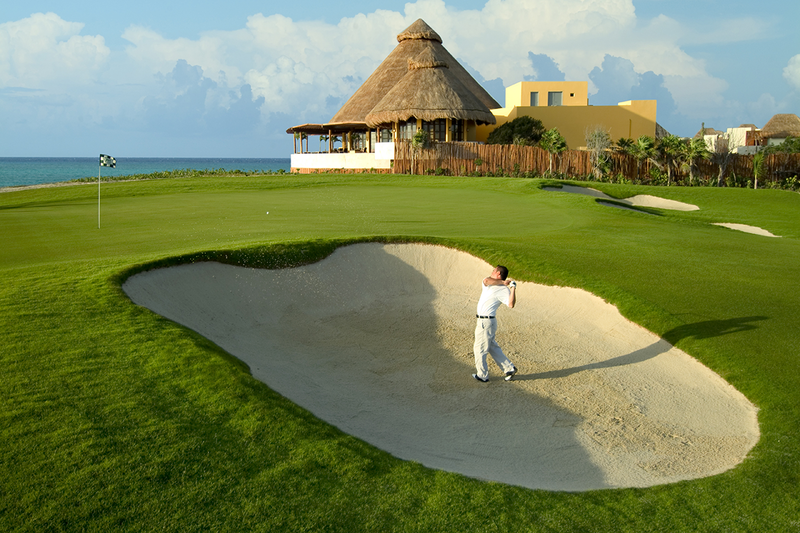 El Camaleón Golf Course is host to the only official PGA TOUR event in Mexico. Guests may also book lessons at the Jim McLean Golf School. The 37,000 sq/ft Willow Stream Spa features 20 treatment rooms including a unique couple’s suite in the treetops, two mineral pools and steam rooms. Family friendly resort. We have connecting rooms available in all categories, babysitting services, a wonderfully designed program for children from 4 to 12 years old at our Discovery Club and a PlayStation Room outfitted with PlayStation®3 (PS3®) consoles, 42” Sony BRAVIA LED Full HD TV’s and wireless controllers for teens from 10 to 7. • Signature Casita Suite (16): 915 sq.ft. – 1003 sq.ft, One King or two Queen beds + Sofa bed, Water canal view. 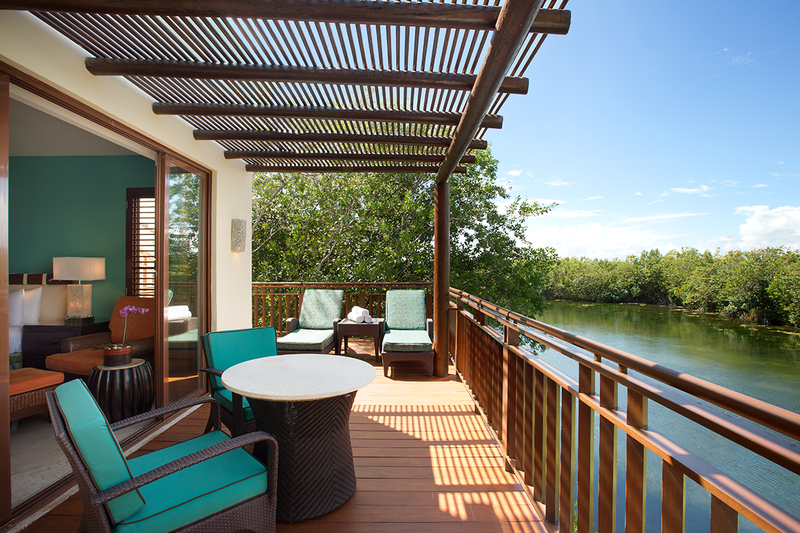 • Beach Area Casita Suite (8): 1,113 sq.ft., One King bed + Sofa bed, Water Canals view from the bedroom; mangrove and sea view from the roof terrace. • Ocean Front Casita Suite (4): 963 sq.ft., One King bed + Sofa bed, Ocean View. 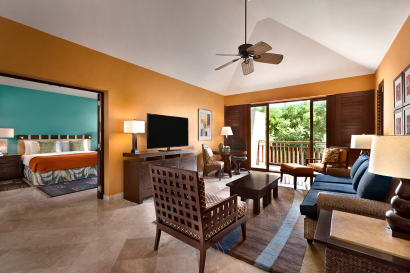 • Ocean Front Premium Suite (2): 1075 sq.ft., One King bed + living and dining room, Oceanfront view. • Specialty Suite Bamboo (1): 1,853 sq.ft., One King bed + living and dining room, Entire property view. 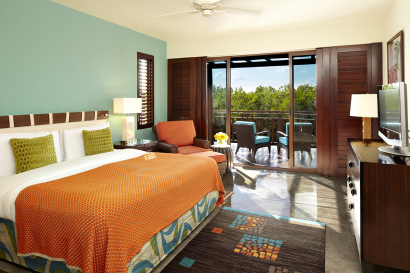 • Specialty Suite Coral (1): 1,495 sq.ft., One King bed + living and dining room, Lagoon and water canals. • Beach Area Casita (16): 458 sq.ft. to 504 sq.ft., Bed Type: One King or two Queen beds, Water canals view. • Ocean Front Casita (3): 587 sq.ft., Two Queen beds, Oceanfront view. • Deluxe Casitas (124): 458 sq.ft. to 504 sq.ft., One King or two Queen beds, Tropical Forest view. • Signature Casitas (143): 485 sq.ft. to 504 sq.ft., One King or two Queen beds, Water Canal view. AAA-4 Diamond award winning restaurant with a Latin-coastal concept that includes a new raw bar cevichería — fresh seafood served ocean to table, an oceanfront bar and a live music stage. Breakfast buffet and a-la-carte Mexican specialities for lunch and dinner served either inside or on the terrace overlooking the mangrove and water canals. AAA-4 Diamond award winning restaurant offering a new Latin-Asian menu, hand-muddled cocktails as well as Latin wines, Japanese sakes and over 100 Tequilas. Menu highlights include Pork Carnitas, Rice Noodles, Kimchee Tofu Soup and Chipotle Miso Glazed Black Cod. New beverage experience and menu with upscale appetizers and sampling dishes with Latin-Asian influence designed to share. 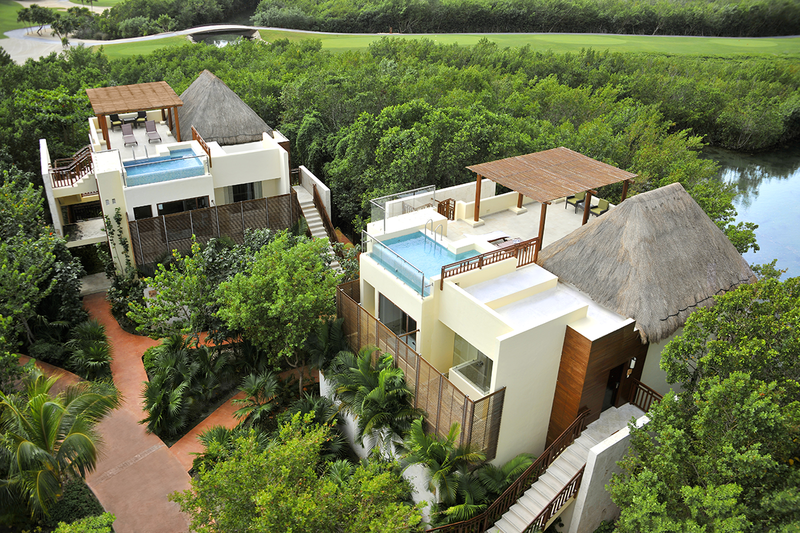 Located at El Pueblito Mayakoba. Guests are able to enjoy an invigorating massage under the leafy canopy of our private treatment rooms overlooking the treetops of the mangrove forest or spend time with a loved one, being pampered side-by-side in our breathtaking couples spa suite. 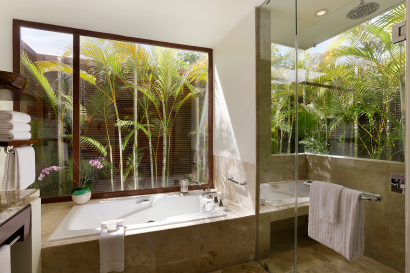 Between treatments, the beautiful Mexican gardens, outdoor Swiss showers and whirlpools of our men’s and women’s relaxation areas will delight the senses. On the rooftop, guests enjoy the healing waters of a signature vitality pool, or take a refreshing dip in a sea-mineral soaking pool. – Minimum age: 18 for spa facilities and 16 for fitness center. 1. The Island Pool featuring one Aqua Bar. 2. Children’s pool boasting a waterslide. 3. Infinity edge adult-only pool. 4. The Beach Front Pool. 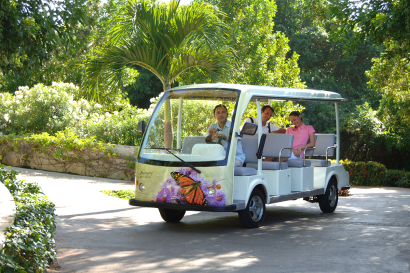 • Tennis and paddle with complimentary access and transportation. Our meeting space consists of 26,495 square-feet of indoor function space, and a specifically designed 8,000-square-foot outdoor event lawn. Two ballrooms – Riviera and Mimosa – are adjacent to their respective foyers, perfect location for a cocktail reception or welcoming hall. 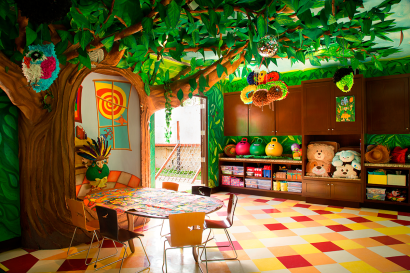 A private lobby, seven large and small breakout rooms, and outdoor space equipped with modern technology can easily adapt to a group’s specific needs. 7,000 yard (6,400 meters) – Designed by Greg Norman – 18 holes – Par 72 – Four sets of tees – 100% Paspalum grass – Four cenotes – Driving range and putting and pitching green – Golf carts equipped with advanced GPS yardage and golfer assistance systems – Clubhouse – Shower/locker facilities – Golf Shop – The Jim McLean Golf School.